In the 1950s and 1960s, the United States and the Soviet Union were engaged in a powerful rivalry. After World War II, both countries began stockpiling increasingly destructive nuclear weapons, and in 1957 the U.S.S.R. shocked the world by launching Sputnik I into Earth orbit, demonstrating that it had sufficient rocket power to deliver a nuclear weapon to Europe or North America. The Sputnik launch galvanized the United States, increasing the demand for scientists and putting much greater emphasis on the teaching of science and mathematics. Each new NASA launch was a national media event, and in 1962 President John F. Kennedy made his famous “We Choose to Go to the Moon” speech, setting the goal of sending an astronaut to the moon and back before the end of the 1960s. I am a product of that Cold War era. In the late 1950s, I was a young boy living in a suburb of Chicago. At school I practiced civil defense duck-and-cover drills in preparation for a nuclear attack, and at home I learned to use a soldering iron so that I could assemble a Heathkit shortwave radio. I taped newspaper clippings about satellites and rockets to the wall above my bed, and my parents bought me a home planetarium that projected the constellations onto the ceiling of my room. I also became a devoted fan of a DePaul University physics professor, Dan Q. Posin. 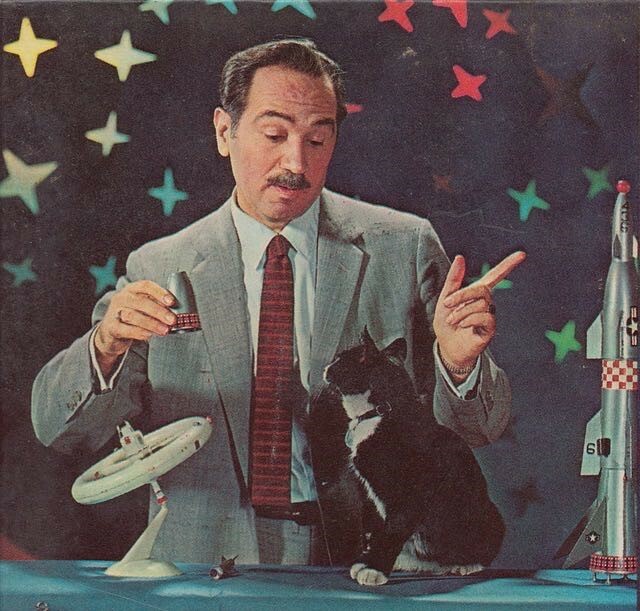 Perched in front of our tiny black-and-white television, I watched this elfin mustachioed man prance around a barren television studio, telling fascinating stories about atoms, comets, galaxies, and space travel. Long before the era of computer graphics, Posin used his considerable skills as a sketch artist to illustrate his programs, and he made effective use of props and posters. His daughter Kathryn accurately described his manner as a cross between Groucho Marx and Albert Einstein, and he was frequently accompanied on set by his cat Minerva, named after the Roman goddess of wisdom. Posin was the writer and star of several educational television series, including Out of This World, The Universe Around Us, and Dr. Posin’s Giants, and his shows aired both nationally on the CBS television network and locally on WTTW, the Chicago public television affiliate. He wrote popular books to accompany his television shows, and I owned several of them. I still do. 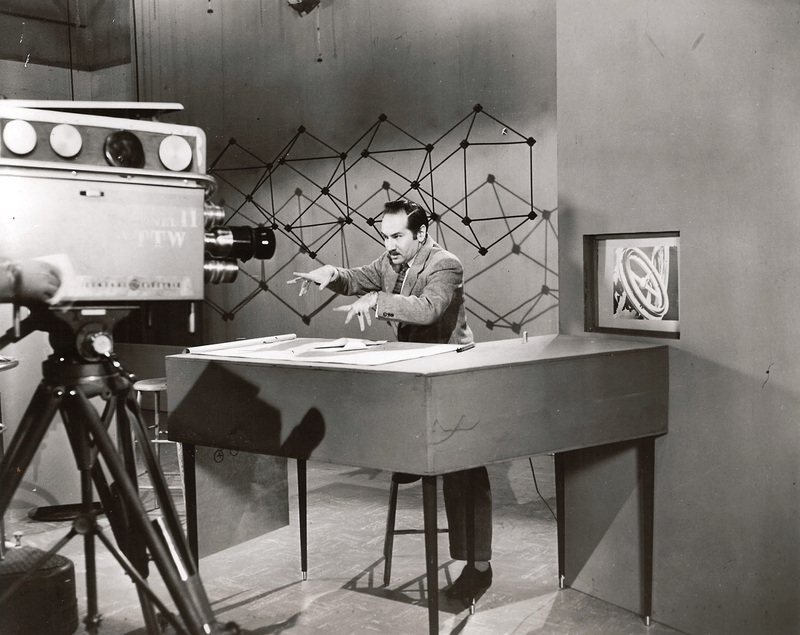 Long before Carl Sagan, Neil deGrasse Tyson, or Brian Cox, Dan Q. Posin was a very energetic popularizer of science who saw the power of television for education and inspiration. He played an important role in developing my interest in science, and he was a beloved figure for many other people my age. Back then, Watch Mr. Wizard was also on the air, and I have some memories of that show. But it was Posin’s programs and books that fueled my curiosity about space and science. Sadly, Posin’s story is largely lost to history, and it was not until many years later, when I began to research his life, that I discovered Posin was much more than the happy science teacher I saw on the screen. Daniel Posin was born in 1909 in Russian Turkestan on the Caspian Sea, and in 1914 his parents fled in advance of the Russian Revolution. Unlike other areas of the Russian Empire, Jews of western Turkestan were allowed to own property and live relatively comfortably, but with the coming of the revolution, the future must have looked uncertain. As a result, the Posin family undertook a harrowing three-year trip across Asia, finally arriving in San Francisco in the bottom of a cattle ship. Having a knack for languages, Daniel quickly learned English and began to excel in school. He won a scholarship to the University of California at Berkeley, where he graduated Phi Beta Kappa and went on to get a PhD in physics in 1935. By then, his father, who worked as a janitor, had died of tuberculosis, and Posin had stolen the heart of Frances “Patsy” Schweitzer, a graduate student in English who was dating a friend at the time. Daniel and Patsy’s marriage would last sixty-eight years until her death in 2002. After graduation, Posin worked as a teaching assistant at Berkeley for two years, and then—after teaching himself Spanish in just two weeks—he accepted a position at the University of Panama, where he taught physics and wrote textbooks in Spanish.1 From there he had short teaching assignments at Montana State University and the Montana School of Mining. By then it was 1944 and World War II was well underway. As a result, Daniel, Patsy, and their two children went off to Massachusetts where Posin took a research position at the Massachusetts Institute of Technology doing research on radar systems. After MIT, Posin took his first substantial teaching position at North Dakota Agricultural College (NDAC) (now North Dakota State University), where he would stay for nine years. While he was at NDAC, two important events happened: he started his television career, and he got fired. Dr. Posin on the set of his Chicago TV program. Posin’s broadcast debut came on June 1, 1953, when he appeared as Fargo, North Dakota’s, first television weather forecaster, “Dr. Dan the Weather Man.” The studio of WDAY-TV was built in a converted two-car garage, and when mice got into the transmitter, the station manager got a cat. In a move he would repeat on subsequent television shows, Posin tucked the cat under his coat so the two could appear together during the weather segment. 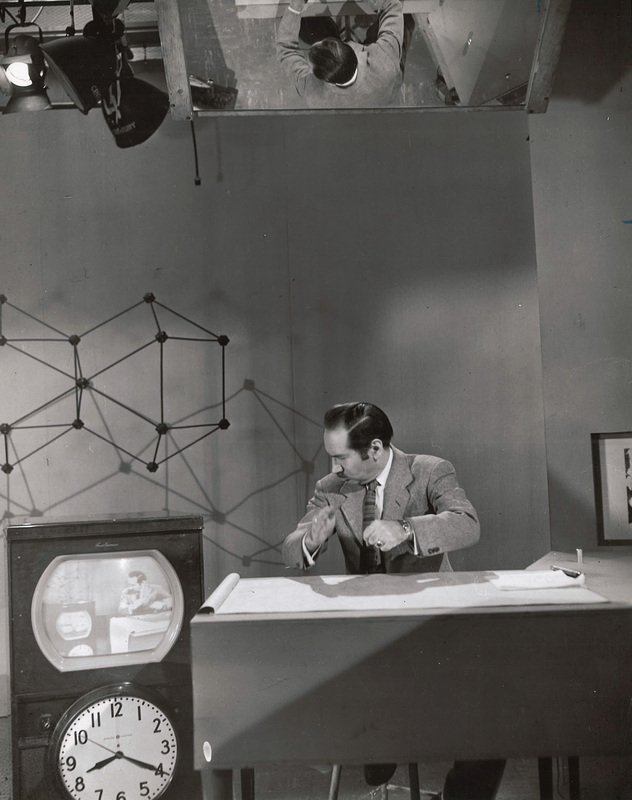 His live broadcasts were done in front of a chalkboard weather map, and WDAY-TV colleagues remembered the popular weatherman’s humorous and dramatic on-camera style. The controversy came to the attention of the State Board of Higher Education in late 1954, and early the next year the Board requested the immediate resignation of the four professors. Posin and the others refused to resign, and, soon after, President Hultz declared the four had “engaged in a course of conduct deliberately intended to interfere with, undermine, frustrate, and render ineffective the administration of the Agricultural College.” The professors were dismissed, subject to public hearings conducted in May of 1955. In the end, the State Board of Higher Education voted five-to-two to fire the professors. The four appealed to the State Supreme Court, but the court did not take up the case. The thing the American people can do is to be vigilant day and night to make sure they don’t have communists teaching the sons and daughters of America. Now, I realize that the minute anyone tries to get a communist out of a college, out of a university, there will be raised the phony cry that you’re interfering with academic freedom. I would like to emphasize that there is no academic freedom where a communist is concerned. Our representatives in New York, in Paris, or in Moscow depend ultimately on decisions made in the village square. Einstein felt an especially strong moral obligation with respect to the bomb. His scientific work many years earlier had foreshadowed the prospect of enormous atomic power, and his actions led directly to America’s construction of an atomic bomb. In August of 1939, Einstein wrote a letter warning President Franklin Roosevelt that recent scientific advances had raised the possibility of using uranium to create a new, devastatingly powerful weapon. Knowing that Nazi Germany was engaged in uranium research, Einstein urged Roosevelt to support an expanded atomic research program in the United States. Roosevelt was moved by the letter, which ultimately led to the Manhattan Project and the creation of an atomic weapon. Later, when it became clear that the German program had failed, Einstein felt a sense of regret about writing to Roosevelt—regret that was greatly amplified when the United States dropped two nuclear devices on Japan. He was a life-long pacifist, and he felt his only justification for writing Roosevelt had been the fear that Germany would be successful in building an atomic weapon. As a result, following the war, Einstein helped form the Emergency Committee of Atomic Scientists (ECAS), whose goal was the containment of nuclear power through a system of world government. By the time he read the passage above, Posin had arrived at North Dakota Agricultural College, and he realized there was an important role he could play. He was in complete agreement with Einstein and the goals of the ECAS, and as a talented science communicator, he was in an excellent position to take the message of peace to the village square. Starting in October of 1946, Posin went out on the road. He developed a speech on the two uses of atomic energy: peaceful and destructive. The life of Marie Curie, whose discoveries led to the development of life-saving medical treatments, was an important part of the peaceful side of the story, but he also covered the destructive power of the atom bomb and the dangers of radiation poisoning. Like Einstein, Posin argued that a system of world government (“a supra-national political organization”) was necessary to contain nuclear weapons and ensure peace. He ended his talks with an appeal for donations to the ECAS. Dr. D. Q. Posin’s book bears eloquent witness to the sincere and self-sacrificing way in which the best among the scientists try to fulfill their duty towards the community. This sense of duty is simply due to the fact that, as a result of their profession, scientists are acutely conscious of the perilous position in which all of mankind has been placed by the new means of mass-destruction. In his attack on the dissenting professors, NDAC president Fredric Hultz urged Posin to stop giving his talks, suggesting that they were anti-American. Once again, Posin ignored Hultz. Ultimately, Posin would give his atomic energy talk over three thousand times between 1946 and 1995. He spoke to groups throughout the United States, as well as in Canada, England, and France. After his dismissal in North Dakota, Posin was hired as a professor of physics at DePaul University in Chicago, a post he would hold for eleven years. It was in Chicago that he achieved his greatest success as a public intellectual and educator. The Posin family arrived in Chicago in 1956, and by February of 1958, he was a local celebrity with a profile in Newsweek magazine and his face plastered on the sides of Chicago Transit Authority buses. An April 1958 article in the Chicago Sun-Times newspaper identified Posin’s show The Universe Around Us as an important ingredient in the financial success of WTTW, the local public television station. One of the many fan letters he received was from a ten-year-old girl who had saved a dollar from her quarter-a-week allowance to send to Posin: “I hope this will help keep your program on the air.” While in Chicago, Posin would win six Emmy awards for educational programming. In addition to teaching at DePaul and starring on television, Posin ran a lecture series for high school and junior high school students at Chicago’s popular Museum of Science and Industry and held training sessions for teachers of high school science. He wrote articles for local and national newspapers and magazines, and he pioneered distance education by teaching an early televised course at DePaul. 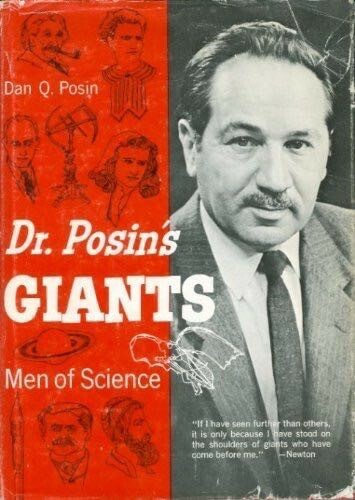 Also, during the Chicago years, Posin wrote several of his best-known science books, including Dr. Posin’s Giants and Life Beyond Our Planet. It is hard to imagine how he did all this and still held down a job and maintained his family life, but somehow he did. By 1967, both Posin’s son, Dan Q. Posin Jr., and his daughter, Kathryn, were grown, and he took a position in the physics department at San Francisco State University. For Posin this was a return to his beginnings as a young boy in San Francisco and a college student at UC Berkeley. It was also the place where he and Patsy met. Dr. Posin was one of my professors at San Francisco State University. I still read his books, 30 years later, and have very vivid images of him lecturing. As a graduate student I got to build some of the RF and electronic devices that were utilized by other students performing research under Dr. Posin in many diverse areas, from plant biology to magnetocardiography. Then it all came together in his class “Science and Human Values.” What an amazing man! I feel fortunate to have known him. Posin would not retire from teaching until 1996, at which point he was eighty-seven. While at SFSU, he won the James T. Grady Award of the American Chemical Society for “interpreting chemistry for the public” and was nominated for the Nobel Peace Prize six times. Patsy would die in 2002, and Daniel Q. Posin died less than a year later at the age of ninety-three. When I began to research Posin’s life, I looked for his children and learned that Dan Q. Posin Jr. had died in 2006 but that Kathryn Posin was still alive and still dancing. 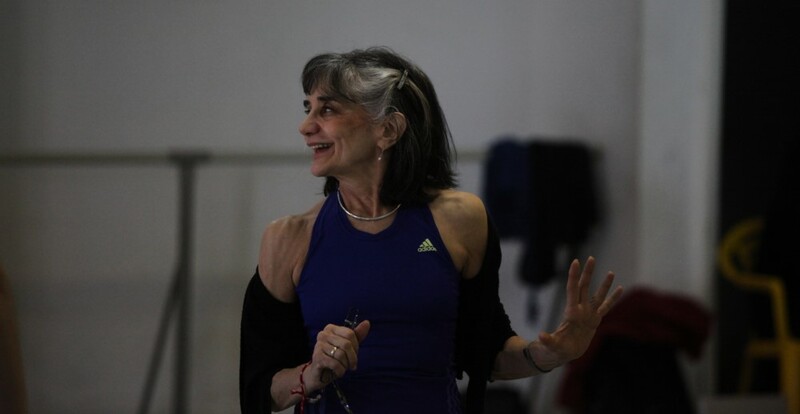 Kathryn is a choreographer and director of Kathryn Posin Dance, a well-known company in New York. She also teaches dance and choreography at New York University. A few years ago, I spent a very enjoyable afternoon in her NoHo studio, which is in the same building where the artist Chuck Close has his studio. Kathryn was effusive about her father. She referred to him as “Pop,” and she was obviously pleased that I was taking interest in his career. She kept his Emmy awards on display and had held on to old tapes of his programs and other memorabilia. She said he was a wonderful parent—as was her mother—and he had been very proud of her as a dancer. She had many fond memories of appearing on his television programs. Kathryn told me a story about the Posin family driving from Fargo, North Dakota, to Princeton, New Jersey, to meet Albert Einstein. Over the years, Einstein and Posin would become friends, united by their work for peace and against nuclear war, but this was their first face-to-face meeting. The eminent scientist had written an introduction to Posin’s book, and the Posins traveled east to thank him in person. When they finally arrived, Einstein was sailing with his daughter, and the Posins waited outside for him to return. Kathryn was just six years old, and this was the first time she had ever seen her father nervous. Kathryn remembered that Einstein laughed graciously at her mistake, but somehow she became aware that she had embarrassed her father, prompting her to run away and hide under a nearby car. She still remembered the smell of gasoline. Eventually the group recovered from this dramatic start, and they had a very pleasant visit. I would love to know what the two men talked about on that day. They were both scientists but with very different talents. Two immigrants to the United States from different parts of the world, both with lives that were touched by history. But two men who, nonetheless, shared very similar goals. As much as Posin might have been in awe of Einstein, I like to think that Einstein, in his own way, might have been equally admiring of Posin. Posin donated the royalties from his Spanish textbooks to a scholarship program at the University of Panama. This article was evidently reprinted in a pamphlet that was sent out to many scientists. Posin reported reading this passage in the pamphlet rather than the New York Times article.